Electronics giant Samsung has announced it will introduce a 2TB USB memory device that is ‘smaller than an average business card’. The Samsung Portable SSD T3 will measure 74x58x10.5mm/2.91×2.28×0.41in and will weigh 51g/1.79oz when it comes to market in February. The company claims that the device will offer read and write speeds of up to 450MB/s via its USB 3.1 Type C interface, and with AES 256-bit hardware encryption and password protection it will not be readable should it be lost or stolen. Although the drive has no moving parts Samsung has given it with a shock resistant case and internal frame that allows it to withstand 1500G of force and/or a drop from up to two metres. The T3 is said to be compatible with a range of operating systems, so it can be plugged directly into TVs and smartphones as well as PCs. The Samsung Portable SSD T3 will come in capacities of 250GB, 500GB, 1TB and 2TB, and will have a three-year warranty. Prices have yet to be announced. For more information see the Samsung website. SEOUL, Korea – January 5, 2016 – Samsung Electronics Co., Ltd., today announced the Samsung Portable SSD T3, a premium, palm-sized, external solid state drive (SSD) that offers multi-terabyte (TB) storage capacity. Equipped with Samsung’s proprietary Vertical NAND (V-NAND) and SSD TurboWrite technology, the T3 drive provides advanced performance, enabling consumers, content creators, business and IT professionals, to quickly and easily store and transfer large multimedia content across a variety of devices. Representing a major step forward for external, mobile storage, SSDs offer a truly dependable and versatile solution. Samsung is leading the market by offering a new 2TB T3 SSD, along with a wide range of capacity options including 250 gigabyte (GB), 500GB, and 1TB. Recently chosen as an honoree for the 2016 CES Innovation Awards, in the Wireless Handset Accessories category, the new T3 drive will be on display at Samsung Electronics’ booth (#11906) during CES 2016. The booth will be in the Central Hall of the Las Vegas Convention Center, from January 6 to 9. With the rise of rich 4K content, consumers are increasingly relying on external storage solutions, while seeking faster data transfer speeds and large capacity on multiple devices. The T3 solves these concerns by enabling blazing-fast file transfers based on sequential read and write speeds of up to 450MB/s with a USB 3.1 interface, which is up to four times faster than alternative external HDD solutions*. Unlike an external HDD, the SSDs do not have moving parts and so the T3 is inherently better protected from damage or data loss due to bumps or drops. Featuring a new shock-resistant metal case and internal frame, the T3 can withstand up to 1500G of force and will survive a drop of up to two meters. The drive’s integrated Thermal Guard prevents overheating in extreme temperatures, and the T3 comes with a three-year limited warranty. 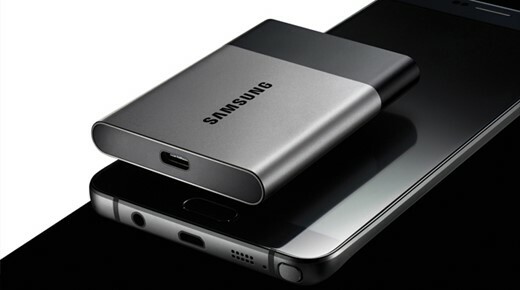 The Samsung Portable SSD T3 will be first launched in February, 2016 in countries including the United States, China, Korea and select European countries and will subsequently become available worldwide.